Historically, economic theory has played a miniscule role in groundwater policy deliberations because of its complexity. This paper is intended for practitioners. Its goal is to distill the seminal 1931 paper by Harold Hotelling and show how it can be applied to manage a quasi-nonrenewable resource like groundwater. Hotelling’s framework is then used to critique both the rule of capture era and the current era of regulation by groundwater conservation districts. The latter also draws heavily on the analysis by Brady et al. in a 2016 Bush School Capstone Report. Finally, a regulatory fix is proposed based on the ideas of Nobel Laureate, Vernon Smith (1977) that would use groundwater bank accounts to assure the efficient use of groundwater over time. The Texas Water Journal is an online, peer-reviewed journal devoted to the timely consideration of Texas water resources management, research, and policy issues from a multidisciplinary perspective that integrates science, engineering, law, planning, and other disciplines. It also provides updates on key state legislation and policy changes by Texas administrative agencies. 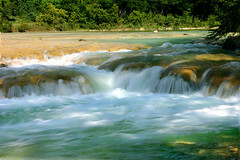 The journal is published by the Texas Water Journal, a nonprofit organization, in cooperation with the Texas Water Resources Institute, part of Texas A&M AgriLife.